It's hard to take your eyes of the incredible astragal that divides this intricate double set of mahogany doors. 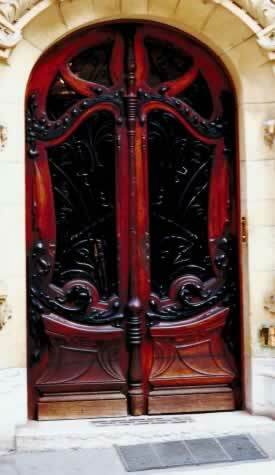 It's the benchmark of the top-quality carving and engraving that adds dark contrast to these rich, red doors. You can tell why 18th Century craftsmen who made fine furniture turned their skills toward creating memorable mahogany doors. The faded large kick panels not only reveal that the craftsmanship has withstood the test of time, they look as if there's plenty of life remaining in this noble entry. Yet, if you look carefully at the right side of the photo, you'll see that the portal has been upgraded with a contemporary entry panel. Not only was this striking mahogany door produced by loving hands, it's been well maintained to extend its service life.